Ambassador Shemi Tzur, Israel's new ambassador to New Zealand, presented his credentials on Friday to the Governor General following a welcome ceremony that included a traditional Maori nose-pressing ceremony, and, as such, officially reopened the Israeli Embassy in New Zealand that was closed in 2002 due to financial difficulties. In the time that passed since then, Israel-New Zealand relations experienced a number of strains, including the passport affair in 2004. Two Israelis applied fraudulently for New Zealand passports, prompting the New Zealand prime minister to impose sanctions against Israel. Only after a year and a half did Israel apologize and guarantee that a similar situation would not occur again. The embassy was in actuality reopened in August 2005, but remained a branch of the embassy in Canberra under the control of Israel's Ambassador to Australia Nati Tamir. Then Foreign Minister Silvan Shalom announced his intentions to reopen the embassy to full service as soon as such a move would be financially feasible for Israel. Current Foreign Minister Avigdor Lieberman continued on this line of thought and ordered that full diplomatic activities be renewed at the embassy in Wellington. Some two months ago, New Zealand's foreign minister met with Prime Minister Benjamin Netanyahu and President Shimon Peres during a three-day visit to Israel to agree on an agreement to grant work visas to young Israelis. Tzur, who has served as ambassador to five other countries, told Ynet that the New Zealand ceremony was a record breaker for him. "I was very touched, and still am. Such an extraordinary I event I have not experienced," Ambassador Tzur said. Tzur was accepted into the post with a ceremony based on Maori tradition of the indigenous residents of the island nation. The tradition has not changed much since the arrival of the first whites on the island. "In the ceremony, they check if the visitors come in peace or in war," explained Tzur. "There is a kind of war dance at the end of which they come close to you and place a knife on the ground. You raise the knife and look into the eyes of the person who laid it on the ground. Then it is understood that you come in peace. "You get close to one another, shake hands, and press your noses together. 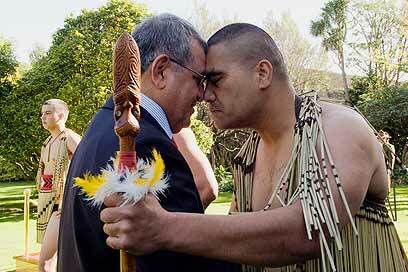 The ceremony is called 'hongi.' The breath mingles together to show that it is a meeting between friends seeking peace. There is nothing more moving than this with the flag of Israel waiving to the sound of cheers," said Tzur. The New Zealand Jewish community also received the news with joy. Tzur was welcomed in a festive reception that included Shabbat prayers. "After eight years of feeling like they had been left behind, they once again have a source of pride," concluded the new ambassador. Foreign Ministry Spokesman Yossi Levy concluded, "The reopening of the embassy heralds a new, optimist page. It will push both countries forward. The consular agreement signed prior to this allows young people to travel and work in both places." See all talkbacks "Israeli embassy in New Zealand opens after 8 years"